New Advertising Portal From Rent My Vacation Home dot com incorporates world wide Hotel and Motel reservation systems into vacation home rentals.Vacation Homeowners can try this for $16.00 a month and cancel anytime. Vacation Homeowners can try this for $16.00 a Month and cancel anytime. As a pioneer in the travel technology industry, Vacation Homeowners can try this for $16.00 a month and cancel anytime.Rent My Vacation Home® dot com has a long history of breakthroughs. With the introduction of the vacation home reservation technology , the world’s first electronic vacation home reservation technology connecting travel providers and distributors, Rent My Vacation Home®dot com opened up a new world of opportunity for the travel industry. With the goal of creating a wider, more accessible market for travel providers and distributors, Rent My Vacation Home dot com works to create solutions that lead to breakthrough performance for every customer. Rent My Vacation Home® dot com vast portfolio of solutions include: reservation, distribution, financial, and representation services. With its endless innovations and reputable customer support, Rent My Vacation Home®dot com has become the largest third-party marketing and reservation provider in the U.S,A. Rent My Vacation Home®dot com serves the ten largest U.S.-based travel agencies, eight of the top ten agencies , more than 70,000 homes around the globe, and more than half of the 50 largest markets in the world. 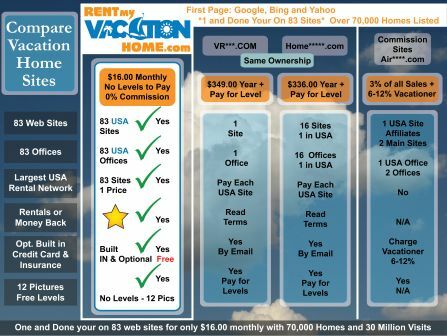 More than a thousand Web sites and services have their reservations powered by Rent My Vacation Home®dot com. Rent My Vacation Home®dot com provides cost-efficient, simplified solutions including:Leading-edge Central Reservation System (CRS) technology for vacation homes to address reservation requirements.CRS connections to the global distribution systems (GDS) and other alternative distribution systems (ADS) Marketing services to drive bookings. Travel Agent processing and reconciliation Breakthroughs happen every day for Rent My Vacation Home® customers. When was the last time you had a breakthrough? •No levels to Pay and 0% Commission.•70,000 Listed on 83 Offices & web sites in the U.S.A.
•30 Million People visit this site every year. •Property description on 83 Sites with one form. •Availability calendar one form for 83 sites. •Inquiry form on 83 sites & 12 Xtra Large Pictures Included.•Video tour on 83 sites with one form. •Your property story on 83 sites from one form $16.00 Mo. Traveler map on 83 sites with one form control. •Optional credit card and Travel Guard check out system. •Vacationers can Save the Search for the next visit. •Reservations come in to you via Email or Phone. •Always on Page 1 - Google, Bing,Yahoo.